If your looking for a comfortable 3 bedroom holiday home in a great location on the water's edge then you have found it here. There is room to park your wave rider boat on the lawn or tie it to the jetty. Lake Okareka is crystal clear and is one of the more popular of the Rotorua lakes being only 10 minutes driving time from the city. The photos tell you the story! Other activities at Okareka include fabulous horse trekking on the Longford's Farm close by. Rubbish bags are provided and collected Monday Morning. Please put out before 8.30am. No tents, camper vans, or camping on the section. * While we have a standard minimum of 4 nights (high season), you may book as few as 2 nights if your dates connect existing reservations. ALL OUR PROPERTIES ARE MONITORED CHEMICALLY andamp; ELECTRONICALLY FOR ANY METHAMPHETAMINE COOKS OR SIMILAR UNSAVOURY ACTIVITIES! JETTY TO TIE YOUR BOAT TO. The property is sunny being North facing and has its own delightful beach with a jetty to tie your boat to. Just the basics...you need to bring your own food. 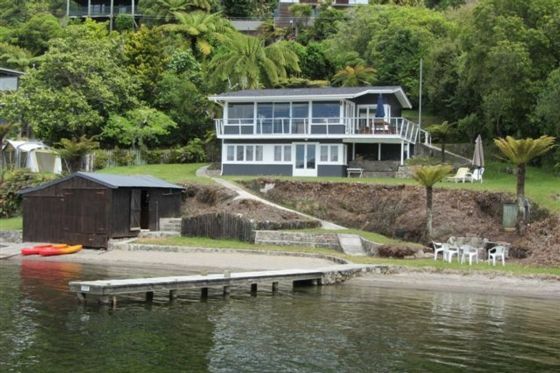 We stayed for a weekend for the Xterra Rotorua Festival and loved the location of the property. A real kiwi bach that had everything we needed to get us race-ready. Not a deal breaker, but boy were the bigger beds and the couch rock hard. The single beds were super soft. Thank you for sharing with us. Great property, enjoyed our stay. Good location, awoke to a great view in the mornings, nice and quiet, would highly recommend the house. Awesome location. Old Bach but clean and tidy. Well equiped. The house location is amazing, great for a family. Nice to have the use of kayaks and the pontoon was a hit too. There is no curtain downstairs which was hard with a younger child when it came to sleep time. Only dissappointing thing is that the cleaning fee is compulsory and the house wasn't very clean. Yes we make our cleaning fees compulsory because more often than not and from past experience people that want to clean themselves and think they do a good job, don't, then we have to pay to do it again........we have a high standard amongst our 30 homes, and we find that those that complain about our standard are usually aggrieved that they have to pay........hence the comments! Fabulous location with gorgeous views from every room except the bathroom! We really enjoyed our stay at this lovely old bach with lots of retro character. Our children are older and loved the downstairs bedrooms, we loved the super king bed! Noted that although there were kayaks and a paddle board, there were no life jackets that the kids could see, so suggest that you take your own. Overall a great place to stay, thanks! Eat Street in Tutanekai St central city runs a food market on Thursday nights with all sorts of ethnic foods available and definitely worth a visit. There is also a Farmers Market at Kuirau Park on Saturday mornings running until midday offering all kinds of fresh produce including meats, seafood, vegetables and ethnic cooked foods! If looking for a movie there are 2 theatres in Rotorua, Reading Cinemas, and The Basement Cinema….this one also has a cafe and a climbing wall. It’s a quaint little picture theatre with 2 cinemas running, each holding around 20 patrons. The local Golf Clubs are Arikikapakapa about 15ks from you, Springfield about 18ks, and Lakeview about 25ks. All are of a good standard.